EA Calls Gran Turismo 5 "Sterile"
Sony's driving series is more about car collecting than racing, says EA's Patrick Soderlund. It's trash-talking time in the world of racing games, with EA VP Soderlund calling Gran Turismo 5 "sterile" and saying that the upcoming sequel to Need for Speed: Shift - Shift 2: Unleashed - would offer a more authentic driving experience. 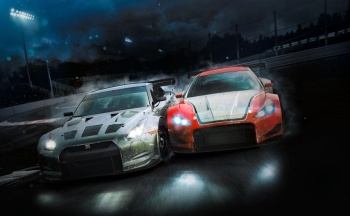 Soderlund said that other games in the Need for Speed series were aimed at a very different audience to the Gran Tursimo series, but that there was a lot of over between Shift 2 and GT5. He was certain that Shift 2 couldn't compete with GT5 in terms of scale, but that the when it came to giving players a taste of what being a real racecar driver was like, it would win hands down. He thought that the car collecting part of the Gran Turismo games overshadowed the actual gameplay, and said that EA wasn't going to take that route with Shift 2. Soderlund's point - that the most authentic recreation of an experience isn't necessarily the one striving to be the most realistic - is an interesting one, even if it must always be viewed in the context of an EA executive talking about a competing product. That said, you could make the counter-argument that a more accurate simulation is more immersive, and therefore a better representation of the actual experience. Either way, after the years of tweaking and tuning that Gran Turismo 5 has received, I think EA is going to have a hard time convincing anyone that Shift 2 offers the superior driving experience. Shift 2: Unleashed comes out for PS3, Xbox 360 and PC early next year.